Gartner has predicted 18-20% growth in SaaS market, and expects it to hit US $22.1 billion by the year 2015. They have also measured that SaaS adoption rate has increased many fold in the last few years (almost 71% of enterprises use SaaS solutions). SaaS has come a long way from “hype” to “norm”. The key to this change is the confidence that has been built by the cloud/SaaS community by providing enterprise class security. Since, SaaS model of delivery has become a defacto standard of delivering products it’s critical for ISVs to ensure that their SaaS product meets the required industry security standards. 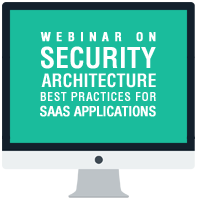 In this webinar, we will address the security aspects related to architecture, deployment and managing a SaaS solution. Reserve Your Seat Now >> – !! Webinar participants will get a chance to win gift coupon worth $25. Jothi Rengarajan, Principal Architect at TechCello. Reserve Your Seat Now >> –!! Webinar participants will get a chance to win gift coupon worth $25.